I recently purchased a TMNT 3 press kit off eBay that included seven color slides. I received the kit today and was amazed at this particular slide, as I can't say I've ever see this photo before. And because it's such an adorable picture, I had to scan it and share it right away!! Murphy has posted the 25th anniversary logo (left) and a link to a brief article outlining Mirage's relationship with Peppercom, the PR agency that will be in charge of next year's 25th anniversary activities. While no specific details are given, some basic ideas are alluded to. 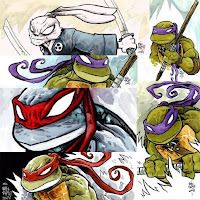 TMNT will have a significant presence at Toy Fair and Comic-Con (I'm assuming San Diego). In some fashion, the Turtles will "tour" the US. The campaign will focus on both old fans and new fans. Murphy has previously announced at The 5th Turtle that as part of the 25th anniversary celebration, Mirage will publish a trade paperback of the first run of Volume 1 comics ("remastered" versions), a "very special" expanded reprint of TMNT #1, and the long-awaiting final tale of the TMNT Adventures universe, The Forever War. The TMNT made their comic book debut on May 5, 1984, which is the date used to mark their official anniversary. 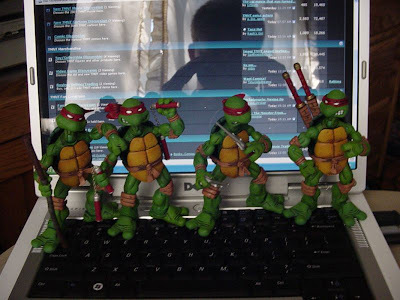 Yesterday I finally received the phone call I've been waiting for - My comic shop had received the case of TMNT NECA action figures I had ordered through them! A whole case! MINE!!! But alas, I'm not keeping the whole case. That's a bit excessive even for me (not to say that it isn't tempting!). 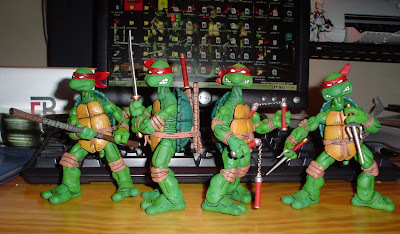 After some time with a box cutter, I had myself four Turtles. If you aren't lucky enough to have your comic shop deliver these fantastic figures virtually to your door, they are now being spotted in several retail stores. Suncoast is one store where they've been seen, but due to the closure of many Suncoast stores in recent years, you may have better luck looking for a Hot Topic, where they've also been seen. And if all else fails, they're now available on Hot Topic's Web site, here. Tales of the TMNT #45, a tale of terror told and illustrated by Jim Lawson, arrived in comic shops yesterday. If your shop still isn't ordering it even after showing them all of your best ninja moves, you can get it direct from Mirage at ninjaturtles.com. Eric Talbot has posted a sample of some of the sketches he did at this past weekend's New York Comic-Con on his blog. Last Friday, TMNT Vol. 4 #29 was made available for download through Wowio.com. Anyone who needs help getting a Wowio account (including international friends) can feel free to contact me and I'll do what I can. However, I have had issues with receiving the Wowio confirmation emails, so I can't guarantee speediness on the matter. You can also order a hard copy of the comic directly from ninjaturtles.com for $10 + shipping (what a deal). “Mind Games ” - In this issue we finally discover what actually happened when the TMNT went west to save Raphael from the clutches of D.A.R.P.A. (as seen in TMNT Volume Two)! Mr. Braunze returns to New York with a deadly pack of villains on his trail, and only the Turtles can save him from a fate worse than death! It's a psionic shootout of epic proportions! “The Decider ” - a brutal crime wave wrecks havoc upon the streets of Springfield, Massachusetts and all evidence points to the perpetrators as being giant turtles! Leo, Don, Raph, Mike, Casey Jones and Master Splinter struggle to solve the vicious robberies and find the real mastermind behind the crime wave before the TMNT are revealed by the local media! TMNT NECA Figures Now Shipping!!! 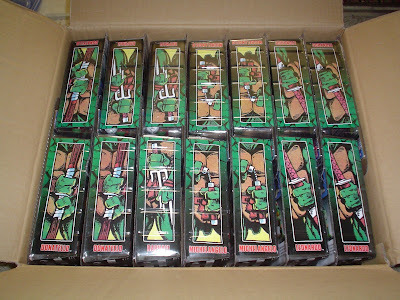 Many TMNT fans today received the unlimited edition box set of NECA's new TMNT figures. This is the box set that includes just the Turtles and their standard weapons; no extra accessories. The individual figures, with all accessories included, should be available within the next few weeks. And don't forget that if you're going to New York Comic-Con you can get an exclusive box set that includes all four Turtles AND all of the additional accessories! Picture above provided by StealthNinjaScyther - Thanks! 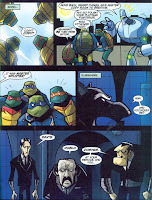 Hero checks in with some scans from TMNT Comic magazine #12, the latest issue of this UK-exclusive publication. 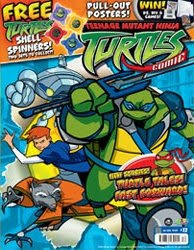 This issue features part one of the story first published in Tales of the TMNT #38, now is full color. It also features the first part of a time-twisting Fast Forward tale penned by acclaimed Transformers writer, Simon Furman, and illustrated by the one and only Diego Jourdan. The cover to the issue is pictured above. Below is a scan from each of the two comics as well as the toy attached to this issue. If you're in the UK, you can click here to subscribe to the magazine or order back issues.